The last night of “The Voice” season 7 Knockout Rounds leaves only one coach left with one steal – Blake Shelton. The artists must chose their Knockout songs to sing against another singer on their team. Adam said Pharrell’s team is “amazing.” Mega-hit singer Taylor Swift continued to advise the teams in the #FinalKnockouts. Blake pitted Allison and Taylor against each other because they are “throwback vintage country singing girls.” He said he can’t bring them both into the final playoffs round. “Sin Wagon” by Dixie Chicks is the song Allison chose to sing. Adviser Taylor Swift advised Allison to sing without her heels one and to get “sloppy” with her performance. Taylor wanted show her “soft, smokey” side so she picked “Landslide” by Stevie Nicks. Gwen paired Beth and Ryan for their “common thread of Pop”. Ryan said he almost “peed his pants” when he saw Taylor Swift. Gwen said Ryan’s overall tone is “so pretty” and that there’s no one else like him. Gwen encouraged Ryan’s “swag.” Taylor said Ryan’s secret weapon is “boy performer charisma” and it makes him “a force to be reckoned with. She advised him to encourage audience screams at the end of his performance. Gwen told Beth that she saved her because she has so much potential, but that she sometimes “over-sings”. 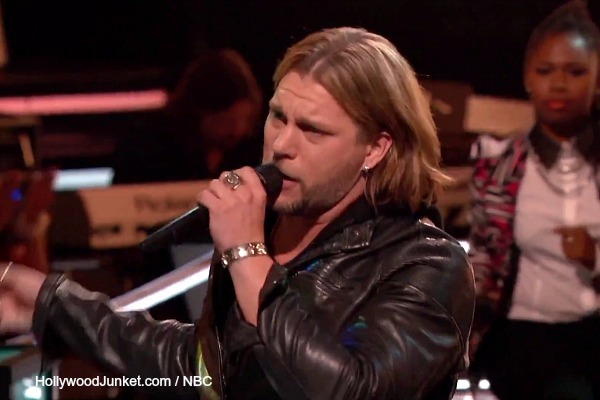 Coaches Comments: Beth’s former coach Adam told her, her voice gets “squirrely.” He told Ryan that he has a beautiful tone to his voice and voted for him. Blake said “Beth puts more of a spotlight on her runs.” Pharrell said he agreed with Blake that its a dead tie. He said it’s a matter of choice and who Gwen wants to invest her time in. Gwen told Ryan that his style is coming through now and evolving in an incredible way. She said Beth’s voice is sometimes “too abrasive.” Gwen chose Ryan. Coaches Comments: Former coach Gwen said Jean gave a “haunting performance.” Gwen said she saw and heard thing’s in Menlik’s voice that she didn’t know existed. Adam said Jean sings with a combination of deep anxiety with relief. “It’s super-potent” he said, and that Melink has the same thing. Blake said Menlik’s stage presence is something he’s never seen before and picked him. He called him a Grandfather clock. Coach Pharrell called Jean’s performance was emotional and dramatic. Based on his gut, Pharrell chose Jean he said “because she emoted” with the crowd. Blessing chose to sing “Your Body is a Wonderland” by John Mayer because he didn’t want to be “categorized as the guy that does R&B”. Swift told him “that was an incredible version of that song.” Adam said it wasn’t a song that he would normally recommend to sing on the show “because there’s not much room to expand upon it.” Chris said he wanted to pick a song that was “challenging and also displayed every aspect of his voice” so he picked “(Sittin’ On) The Dock of the Bay” by Otis Redding. Coaches Comments: Blake said Chris “sang the crap” out of his song, and he loves Blessing’s smile. Former coach Pharrell told Blessing there were places that were pitchy and favored Chris for surprising him. Gwen said she almost didn’t recognize the song that Blessing sang and she was “blown away.” She was impressed that Chris did his song in a modern way. Coach Adam said Blessing is amazing because he’s able to sing any song any way. He told Chris that he was “courageous” for singing “Dock of the Bay” and chose him as the winner. Adam completed his team in his last Knockout round – Matt McAndrew vs. Rebekah Samarin. Adam told Matt that no one else in the competition commands the audience like he does. 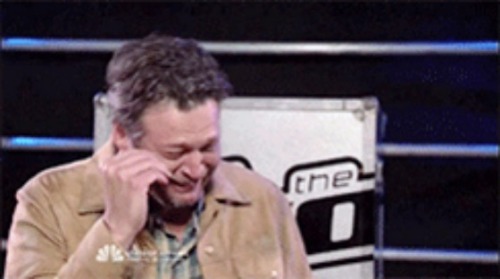 We, as well as Blake (his reaction below), were disappointed that Matt McAndrew’s Knockout round was not fully shown and NBC decided to edit it into a montage. Boo! Blake paired the two youngest singers on his team – Grant and Reagan. Grant chose “Apologize” by One Republic. Blake said he was impressed that Grant chose such a tough song. Reagan chose to sing “Hit Em Up Style (Oops)”. Taylor Swift called Reagan a freakish anomaly who knows what to do on stage. Blake said it is a tough song for anybody let alone a 15-year-old-girl. Coaches Comments: Pharrell said he welcomed the note that Grant belted out and that Reagan was “addicting to watch.” Gwen said Grant did a great job and was impressed with Reagan’s young talent. She told her she’d like to see her dress her age. Adam pointed-out Grant’s nerves. He said Reagan’s talent freaks him out because she’s younger than Grant and envies her confidence. Coach Blake said the nerves got to Grant, and he needs to decide which voice to go with. Blake said Reagan can sing any song and “sprinkle some Reagan on it” which makes her very artistic. He chose her as the winner. Blake labeled Reagan as the most important artist that he’s gotten a chance to work with. Another knockout of second chances – It’s Anita’s second shot on “The Voice” and Gwen stole Craig from Team Blake. Gwen and Taylor Swift encouraged Anita, who chose “Rude” song, to embrace her Jamaican accent and moves. Craig chose “Can’t You See” because he wanted to show more of his gospel roots. Taylor Swift advised Craig to take the audience “to church.” Gwen and Taylor did a mini make-over on Craig. Coaches Comments: Adam said Anita came out of her shell. He said Craig makes him feel a little less of a man. He picked them both. Former coach Blake told Craig it’s like seeing a hot ex-girlfriend and called his performance “unbelievable”. He said there’s something special about Anita. Pharrell said Anita was super-confident. Coach Gwen said Craig commanded the whole audience and that Anita was amazing. Steal – Blake pushed his button to steal Craig back. This was Craig’s official second steal.